This week I was finally able to see Damien Hirst at Tate Modern. I’m a big fan of Hirst, and it was a treat to see so much of his work in one place. I saw some old favourites, like The Physical Impossibility of Death in the Mind of Someone Living and Pharmacy. But I think I may have added another piece to my list of favourites: The Anatomy of an Angel. 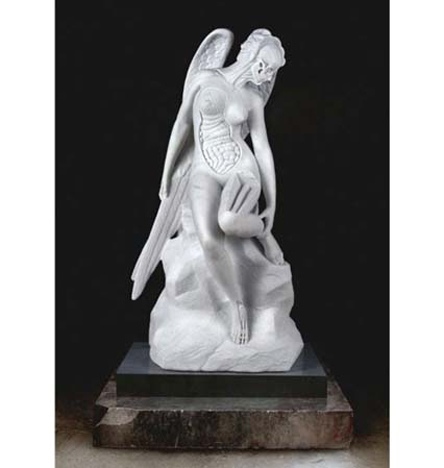 At first glance, The Anatomy of an Angel looks like a classical sculpture of an angel, beautifully carved from carrera marble. But as you look, you realise that parts of the angel have been neatly cut away to reveal organs and bones beneath, resembling the anatomical models which are familiar from Hirst’s work.